Welcome back to Inside the Mind of an NYC VC, a new series at AlleyWatch in which we speak with New York City-based Venture Capitalists. In the hot seat this time is Josh Lucido, Director of Investments at Matter, an accelerator and early stage venture firm focused on media entrepreneurs. Josh stopped in to chat with us about the what the team looks for in accelerator applicants and investment opportunities, some of the challenges facing media today and what entrepreneurs are doing to solve them, milkshakes, and much, much more. Bart Clareman, AlleyWatch: Matter has both an accelerator and an investment arm. Take us through both of those. 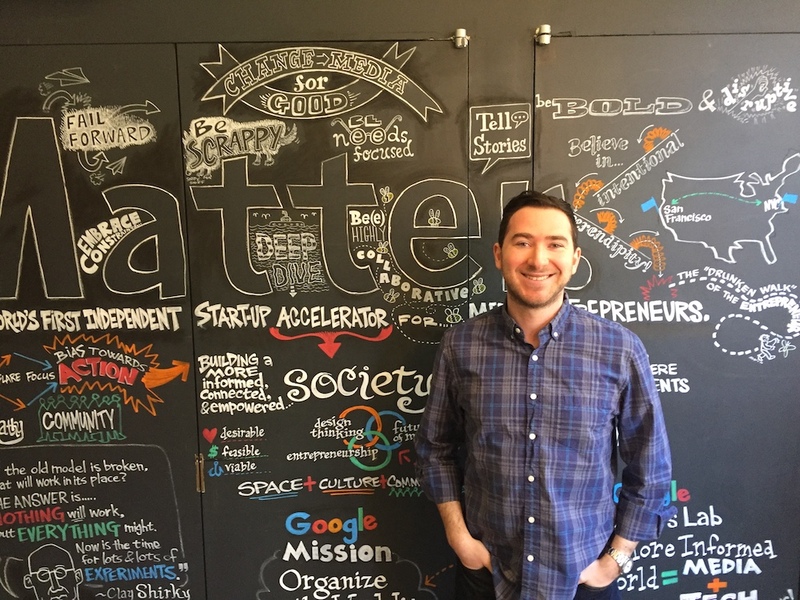 Josh Lucido, Matter: The accelerator started in San Francisco five years ago. We just finished our sixth cohort and now we’re on to our seventh. We started in San Francisco with six teams per cohort, which was roughly once a year. We expanded to New York last year, and we added six teams in New York. Next year we’ll do two cohorts per year in each location, by which point we will have gone from six companies out of SF to 12 companies across New York and San Francisco in 2016-2017, to 24 companies starting in 2018. Those are Seed and Pre-Seed companies. We invest outside of the accelerator if there’s an opportunity that’s a mission-fit; a company that might be too far along for the accelerator, say, but is nevertheless a great opportunity for us. Parlio is an example of a company we invested in outside of the accelerator – they were later acquired by Quora. It’s not that we have two separate funds, it’s all the same fund. On the investment side, we actively look for Seed deals, but we don’t have a quota or a number we’re targeting every year. It’s what’s interesting and what’s a good fit for us, and how we can help. Because we’re an accelerator, we have what we hope is a real value add for our portfolio companies. Just cutting a check and hoping to get an update once every quarter isn’t something we’re excited by. We want to make sure there’s a real reason and a real fit for us for a non-accelerator deal as well. Tell us about your journey into the venture business and how you came to join Matter? I started my career in media and entertainment. I was at ABC News for a little while, and then I transitioned to run film and TV sets in the directors’ guild. I spent about seven years doing that. I loved media, but I was looking for something different, I wasn’t exactly sure what it was so I went back to school and got my MBA from MIT. I did two internships, I did an internship with a startup here in New York called One Fine Stay, which was awesome. For my summer internship I worked at a PE firm, American Industrial Partners, mostly because I was excited about learning how to do finance. They’re a great firm and I had a tremendous experience there. I was really excited about startups after leaving Sloan, and I basically have been in startups since graduating in 2014, and most of them have been media. I’ve spent time in a lot of different companies across media – though sometimes overlapping with other areas, like fintech within media, or VR, many different things. It sort of played to what I was most passionate about, which was media, but I still felt like no matter where I was there was always something I was just sort of missing a little bit. I was consulting, I went to run finance and ops for BeautyCon, and left when my wife had a baby; it was time to prioritize family for a while. I did the dad thing, started consulting again, and then a friend sent me the post for Matter. It was everything that I wanted. It was media, it was working with startups, it was investing, and then the kicker was that it was a mission-driven VC. We talk about the drunken walk of the entrepreneur – my drunken walk culminated in this, which is my dream job. I feel really lucky to be here. I love that turn of phrase, “the drunken walk of the entrepreneur.” Define that for us. That comes from our managing partner; it’s the idea that we are all on this path. There’s no linear path to success. It’s a lot of detours, it’s a lot of emotional rollercoaster riding, and the founders who are able to embrace the drunken walk and the idea that there’s a lot of obstacles in the way that you have to overcome to be successful, those founders tend to be more successful, the ones that approach the path of entrepreneurship with an open mind and recognize it’s not linear for anybody. I did my own drunken walk to Matter across media, finance, startups, even a Fortune 100 company. If you embrace it you end up hopefully where you should be. Where does your passion for media come from? I love stories. I don’t really care in what medium they’re presented, whether its text or a show or audio – I’ve always loved telling stories, writing stories, listening, reading, watching. We talk about media as connecting hearts and minds; I feel like a good story does that, and my interests stem from there. Early in my career I thought I wanted to write in TV, actually. It’s about connecting with people. It’s really easy to do that through storytelling. Media is always a common ground. If you’re at a party or if you’re meeting someone for the first time, there’s always some sort of common ground in asking “what are you watching,” or “what books have you read lately,” or “did you read that article about XYZ,” and a lot of it revolves around media. That’s why it’s so powerful. The list of challenges to the media industry is well documented: shrinking newsrooms, shorter attention spans, fake news, editorial bias, echo chambers. How do those challenges impact your work at Matter? We’re all media people at Matter, internally. Corey who’s our managing partner, he was a journalist with FrontLine where he was a producer. Pete was a journalist. I came from TV and film. Everybody is passionate about media, and we want to find the companies that will help to sustain media. That’s not to sustain the legacy media institutions. There’s a difference between helping legacy media and just helping media. It’s no secret – you can look up any of our blog posts – we feel that media is under siege in the current political climate. Before this political climate it was still under threat from changing business models. What we care about is having media around so that people can be informed and connected as a society. That plays into our mission of investing in companies that will inform, connect or create a more empathetic society. We’re not happy with the state of media, but that gives us all passion to do what we do every day. Four of us started on the same day, January 23rd: myself, our Director of Investments in San Francisco, our Director of Partnerships here, and our Director of Program here in New York. We all started the Monday after the Inauguration. It was a pretty intense day, and we all talked about why we’re doing what we’re doing, why we’re excited, and our goals for the next four years. Thematically we all ended up with, there’s a purpose and a meaning to what we do that’s even greater than it was before. Even if I didn’t think that I had the best job in the world, which I do, I would be able to derive purpose. That gets back to what I was saying earlier about what I was missing earlier in my career: that’s the last piece of the puzzle. What we do every day matters, because we’re helping to connect society in a very real way, and helping to find the companies that will do that. How has the national conversation about the media changed what you’re looking for as applicants to the Matter accelerator or as investment opportunities? We brought our partners together on the Friday after we all started, the 27th of January. Between several of our partners and the internal Matter team we came up with five thematic areas that we care about. The first is: truth and trust in journalism – that’s fake news and misinformation that falls into that bucket. The second is emerging technology – VR and AR. The third is security – that’s security of information, security for journalists, security very broadly defined. The fourth is diversity and inclusivity, which is not just about amplifying voices, but it’s about making sure that there are decision makers from underrepresented groups – from women and people of color. Finally, the last is sustainable business models. Beyond just ad sales, that’s something our partners really care about and we really care about. We’re not ruling out any applicants, but we’re definitely paying closer attention if they focus on these five themes. And so far we’ve seen is a lot of applicants address one of the five – you don’t have to address all five – though I would say we haven’t seen any security companies come through so far, which I’m disappointed in. We’ve seen a lot of interesting business models – companies that are trying to help sustain the journalism industry through other business models. We’ve seen a few really cool AR and VR companies come in. And then on top of the inbound we want to proactively find as many great companies as we can. What types of companies do you think will ultimately win in “sustaining media”? I think they’re going to be companies that can drive a higher level of engagement. It’s hard because we have a great portfolio of companies and I hesitate to single individual ones out, but when I think about sustaining media, there are a few in particular that come out. We have a company, Hearken, that helps newsrooms figure out what stories matter to the people who are reading or watching their content. Nuzzel is another example of one that’s driving engagement in a really big way. It reminds me of a quote from Daniel Goleman, the author of Emotional Intelligence, who said, “an abundance of information creates an impoverishment of attention.” The companies that are going to win are the ones that can grab your attention in a very compelling way. I was at MisinfoCon a couple of weeks ago, and we were talking about the dangers of misinformation and disinformation and how that’s affecting our society. Someone asked a group of us there the question, “what kind of content do you subscribe to?” And one person said Netflix and another said Hulu and another said Amazon Prime. So then I paused the conversation and said I wanted to point out, nobody said they subscribed to The New York Times or The Wall Street Journal. For news to continue to stay relevant those legacy institutions have to realize they’re competing for people’s downtime just as much as Netflix is. It raises the question of whether media institutions like The New York Times or The Wall Street Journal can survive in this new media environment. Do you believe they can? I think if they’re trying to survive they’ve already lost. If they’re trying to innovate and they’re trying to find companies that are going to do amazing things, that’s how they’re going to sustain themselves and thrive and be a leader going forward. Back to the themes you’re paying attention to – one was diversity and inclusivity. Does that ever mean geographic and ideological diversity as well? That is a great question. Absolutely geographic diversity – yes. We talk about diversity a lot because it’s really important – that’s not just race or gender, it’s also age, which in Silicon Valley is an issue, and it can also mean geography. We want companies from all over the world; we’ve had companies do the accelerator from all over the world. Ideologically, it would have to be something that is in line with our mission. You don’t have to have the same political views as us, but if your message is divisive or your startup is divisive, it’s just not a mission fit for us and that’s what it comes down to. Unfortunately I think in this political climate there are a lot of people who would look at what we’ve written and say, “they would only invest in liberal founders,” and that’s not the case. But it is harder, given the climate, to say how are you going to create a more empathetic society? If you can do that, then we’re interested. On your website it says that Matter is “looking for early-stage media ventures that are changing media for good” – say more about that. What is the barometer for “good”? We’re looking for companies that are informing, connecting or helping to create a more empathetic society. Media we define very broadly because there’s a lot of ways different types of media can connect people or inform people. You can be working with videogames or news or film or journalism – anything within media and we’re interested. I can’t stress strongly enough that we define media very broadly. The mission is definitely something we take seriously, it’s in everything we do because the media is how we all connect as a society. You can yell about Facebook and echo chambers and that’s fine, and they probably did have a part to play, but we’re looking for companies that will help fix that echo chamber and fix the divide and learn from each other. That’s not to say that’s the only thing we care about. We are a for-profit company; we’re looking for returns. We look for great teams that are doing something important that have the opportunity to scale. Because we think that scaleable ventures can ultimately have more of an impact. We love non-profits but we think scalable ventures can have more significant impact across society and across the media landscape. Tell us about the ideal applicant for the Matter accelerator – what do they bring from a product perspective, and what do they bring from a team perspective? It’s a team of founders who have diverse set of skills who will support each other, who are thinking a couple of years ahead, “skating to where the puck is going to be,” so to speak. We definitely love it when we see teams that have been successful before, but I think what it really comes down to is, do we believe the founding team is up to the challenge ahead of them? If they’re first-time entrepreneurs that doesn’t matter as long as we believe in them and believe they will be the right team to tackle the problem they’re trying to solve. From an outcomes perspective, how should a company in your next cohort expect to benefit from participating in the Matter accelerator? We take design thinking and apply it to entrepreneurship. Design thinking is a framework that is user-focused. We like to think that if you embrace design thinking and leverage the takeaways you will effectively eliminate the market risk. Then all you’re left with is the tech risk or the business viability risk. And to some extent you should be able to eliminate those also through design thinking. If you are a media company and you are mission-aligned with us, we should be the first place you go. Our network is all within media: across media companies, across other media investors. It’s in our DNA as people and as a company. Our value-add is what we’re teaching in the program, and the access that we’re able to provide. And if there were a third thing, it would be that we’re quite active for our alumni. Because we’re smaller, we have the opportunity to take a very active role if the founders want, after they’ve graduated from the program. Compare the applicants you receive in New York to those in San Francisco – how are they alike, how do they differ, and what can they learn from one another? Well, one thing I’ve observed is that a lot more international companies apply to the New York program than the San Francisco program. The Bay Area is the innovation capital of the world and New York is the media capital of the world. Being a New Yorker I’d love to say there’s something special about New York – but it could be that just depending on geographies it’s an easier flight or time difference. I think there’s something special about being in media tech in New York. Because it’s a small ecosystem, everyone is looking out for each other. I’ve been on this side of the table for only a little while now, but everybody I’ve encountered has been extremely helpful and really wants to see the New York ecosystem thrive. It’s not that San Francisco doesn’t want that as well, it’s just harder because everyone is in the startup world there, so it’s less unique if you’re doing something within startups. Say more about being new to the world of VC – how does it compare to expectations and what have been the greatest learnings so far? Because we’re so early stage, it requires a lot of emotional intelligence. If you’re doing Series C and D you’re getting more onto the private equity side where it’s numbers and EBITDA and that kind of stuff. We have companies that are pre-revenue. At that point you’re looking at the team and that’s 65% of your decision. In fact, 65% of startups that fail are due to preventable founder issues. What we’re trying to do is figure out if we can see those issues. I think that people who have been in the game a long time are better at it, but I don’t think there’s any VC they can spot it every time. If they could they’d have returned $10bn to their LPs and be multi-billionaires themselves. There was a social psych study done about trying to tell if people are lying. The general population, across the board – age, gender, job function – it was 50-50, basically a coin flip, as to who could tell when others were lying. The only subset of the population that did marginally better were secret service agents, but they were only at 60%. As I continue to see more teams, I’ll get better at evaluating them, but there are little things you can pick out already. That goes back to the heuristics people use – prior founding experience, say – but I don’t want to just rely on that if that means you’re not going to invest in first-time entrepreneurs. How do you identify the 65% of startups that will fail due to preventable founder issues? I would be very arrogant to say that I have that answer. The way that you start thinking about it at least is by observing how founders interact with one another, understanding how they met and whether they’ve known each other a long time? Have they each founded companies separately from each other? Did they always share a passion and connect someway? Now, it’s not bad if there’s just some random happenstance, we believe in intentional serendipity, being in the same place at the same time. Put it this way – I can tell you what some red flags are. Founders that don’t seem in sync with one another, founders that very early on tell you different stories of where they want to go with their vision, founders that have built something but can’t decide where the first flag they’re going to plant is: should this be a B2C platform or a B2B play, one founder feels one way and the other feels another and they’ve had the product for a year, that’s probably a bad sign. You want to see founders be on the same wavelength. Any reflections on the job so far? I think it’s something that we remind ourselves internally: we have the best job in the world, we have the golden tickets and it’s important to remember that. We don’t eat when people are pitching, we don’t have devices out when people are pitching. Founders are coming to us after pouring their heart and soul into their ventures. We are lucky to be able to see these people, and we want to treat them with respect and make sure that their experience in dealing with us is as positive as it can be. Because were it us on the other side of the table, we would hope other people were doing the same for us. So, the greatest learning is that you have to constantly remind yourself of that, otherwise there’s the potential to become jaded. To help the companies that you’re seeing even if you’re not going to invest in them with feedback or something like that. On the website it’s noted that you are a chocolate milkshake aficionado. What makes the perfect chocolate milkshake? First of all, it has to be made with chocolate ice cream. You’d be surprised the number of places that purport to have a chocolate milkshake, but they make it with vanilla ice cream and chocolate syrup. It’s upsetting, but I now have to ask if they make it with chocolate ice cream. Making it with chocolate ice cream is the starting point. Thickness is important. It should really come in a metal tin, or at least be big – I’m not excited by like a tease of a 6oz milkshake. That’s not what I’m going for. If it’s 20oz it’s probably up there on the list for me. I’m not into the boozy spiked thing; if it’s a chocolate base I’m willing to entertain some interesting things, like maybe there’s a smores milkshake where they do a graham cracker type thing, and that’s cool. But I don’t need a cheesecake in my milkshake.